Kakuro (cross-sums) is an addictive puzzle game from Japan and is often qualified as Sudoku's bigger brother. If you enjoy solving Sudoku puzzles, you will surely love to be challenged by Kakuro. And ... don't be misled by the first impression - Kakuro is much easier than it may seem and involves more logical than mathematical skills. 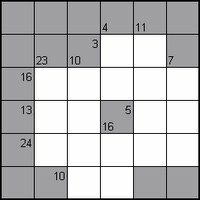 A Kakuro puzzle is represented by a rectangular area of empty and non-empty cells, similar to a crossword puzzle, but instead of words it consists of number sequences, each of which is associated with a clue, located on the left of the sequence (across clues) or above the sequence (down clues). no number appears in a sequence more than once. Each Kakuro puzzle must have a unique solution.